Guess how I got to spend Sunday afternoon? Sawing logs!! No, not taking a nap, though that would’ve been nice as well. 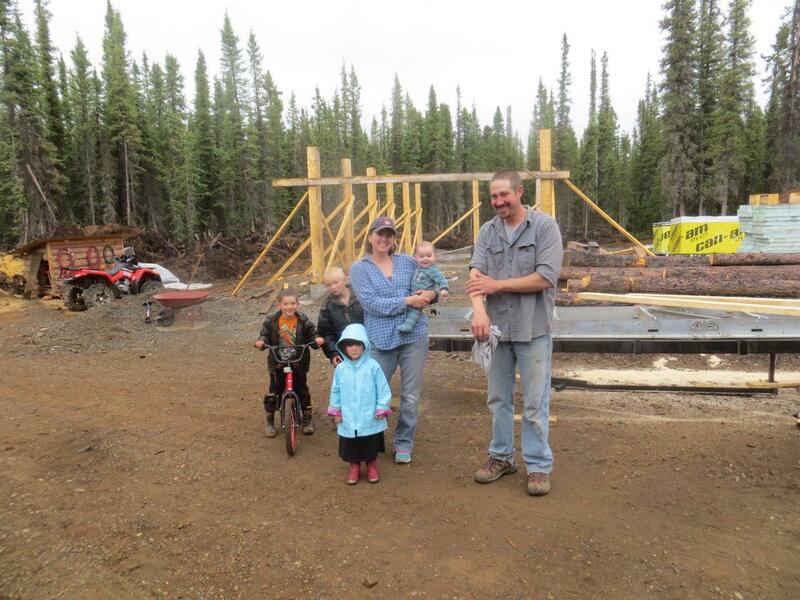 I finally got my turn at the sawmill!! Yippee!! Hooray!! I’ve been watching everyone else get a turn, but have been relegated to watching the baby (note to anyone wanting to build a house…a 9-month-old greatly inhibits your ability to participate!) Maddox was sleeping in the car, the other kiddos were jumping on the trampoline, and I seized the opportunity to finally saw some logs. Stretch has gotten lots of turns. 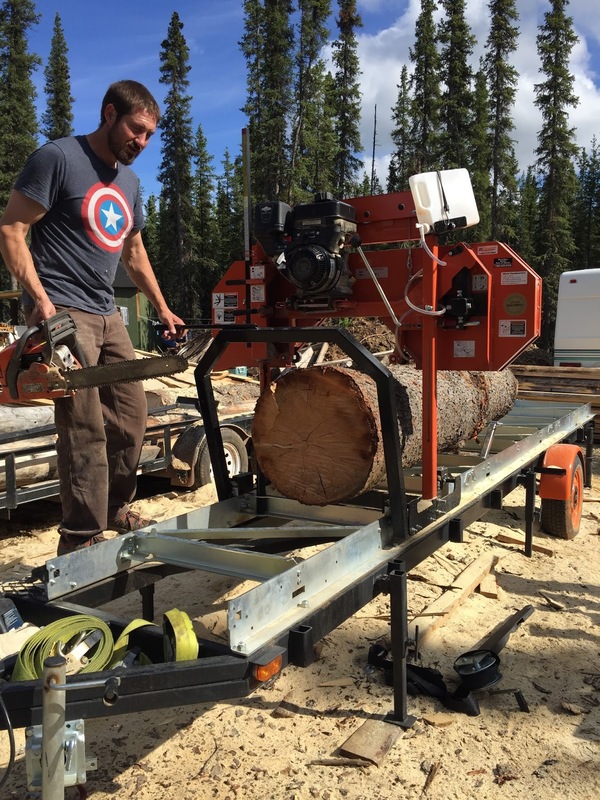 So I helped muscle the first log onto the Wood-Mizer, and Stretch gave me the lowdown. He told me about the air-assisted thing-a-ma-gig that supposedly makes it easy to raise the saw up and down. Then there is the locking mechanism that prevents the blade from rising or falling once the air-assisted thing-a-ma-gig is in place. The choke and kill switch are right close together. The blade engine turn on handle has to be in the correct location. Then there’s the throttle…..at this point my eyes started glazing over and head was nodding involuntarily all the while my brain was hoping he wasn’t going to be going too far off from the mill site. 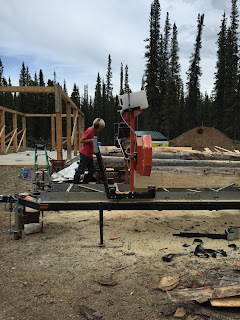 With the tutorial done and forgotten, I hopped up onto the trailer deck and pushed the saw through for my first cut. Two things surprised me with that first cut: 1. How smooth and easy a thin piece of metal can cut through a huge tough tree. I literally thought, ”Man, it’s like cutting through butter!”. 2. How much I enjoyed the sheer power of cutting through a huge tree as if it were nothing! This could get addicting! I can completely understand why people like big tools. Even little Titus cut it up! 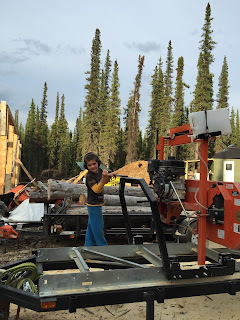 So I sawed and helped load the trees on the mill (though in reality Stretch did most of the loading. You’d think that lugging around a 20+ pound baby everywhere would make my arms strong….wrong!) I made 2 by something-or-others for the trestles and 7 inch logs for the house. The baby woke up, but I wasn’t finished. I threw him onto the trampoline with the others and made them babysit. 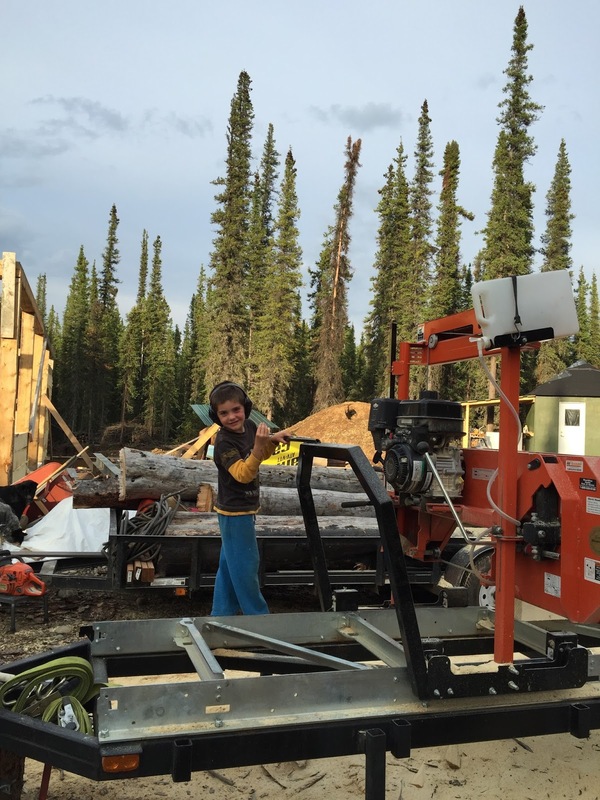 It lasted a good hour, and I was just finishing the biggest tree we had ever milled, a huge monster that we got two house logs from, when the kids lost their patience with mom’s lumberjacking. Finally!!!!! That's the big monster of a log. I had so much fun and learned a new skill in the process. And you know what? God even whispered a little something in my heart to me. Seeing the process up close and personal gave me the impression of how alike we are to the logs. The bark and the roundness are all things that the Holy Spirit prompts us to cut from our lives, whether it’s sin, a job, a person, a place, good, or bad. Some cuts will be messy with bark flying everywhere and pieces of worthless junk left over. Other times the cutting will be cleaner, with something of use leftover like a 2 by 4 or a lesson to pass on or a skill needed for the future. Amazing what God can build in our lives if we just let Him get behind that Spirit-assisted thing-a-ma-gig and cut away!